A commonly used weed killer could be wiping out bee populations around the world, scientists have warned. Glyphosate appears to destroy the so-called good bacteria in honey bees’ guts, leaving the insects more prone to infection and even death, according to researchers at The University of Texas at Austin. The weed killer works by attacking an enzyme in a special pathway found in plants and some microorganisms, but is not believed to harm animals such as bees. However, in a study published in the journal Proceedings of the National Academy of Sciences, researchers hypothesized that as glyphosate can kill microorganisms, it would also likely damage a bee's microbiome. Microbiome is the term used to describe the bacteria which populate the inside and outside of living organisms, including humans, and is believed to play a vital role in maintaining health. The authors of the study urged policymakers to draw up better guidelines for glyphosate use, and called on those who use products containing the chemical—from farmers to amateur gardeners—to stop with plants which bees might collect nectar from. Erick Motta, a graduate student who led the study, told Newsweek: "Honey bees rely on these bacteria for food processing, regulation of host immune system, and protection against pathogens. "So, changes in this microbial community may favor the spread of opportunistic bacteria, usually found at very low abundances in the bee gut. This spread can result in disease and bee death, based on our experiments." To investigate the role the weed killer plays in the depletion of bee populations, researchers collected honey bees with established gut microbiota. They dosed the insects with glyphosate at levels equal to those found in crops, and labeled them so they could be tracked and found again. They repeated their experiments on bees from a different hive. While bees with healthy microbiomes could fight off Serratia marcescens, a common pathogen which infects bees, those with depleted good bacteria were at greater risk of dying when they came in contact, the researchers found. Half of the healthy bees survived after exposure to the pathogen, compared with a tenth of bees given glyphosate. 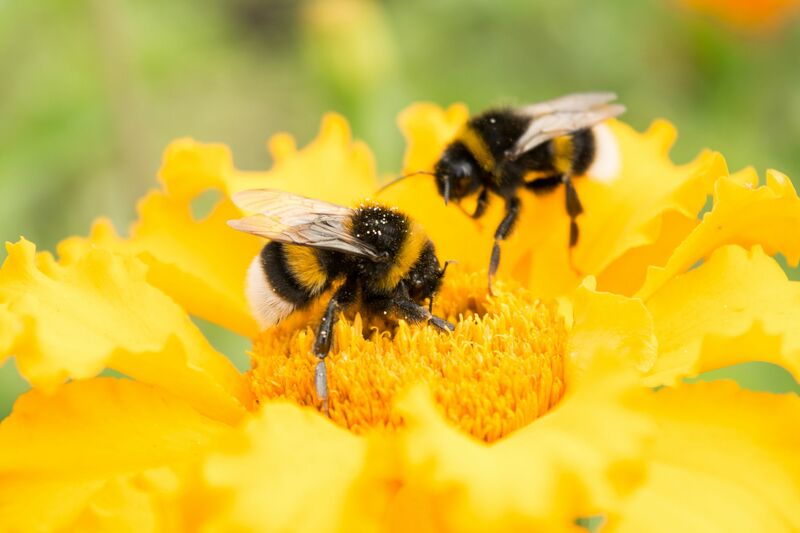 Dr. Dave Goulson, professor of biology at the University of Sussex, commented that the study is well-conducted, but asked how bees could ever become exposed to the herbicide in the real world. "Glyphosate kills plants, so contaminated flowers will soon be dead and of no interest to bees. Nonetheless, glyphosate is sometimes found in bee food stores, at concentrations similar to those used in this study." He added that scientists who have studied bees have long concluded that colony health is adversely affected by a number of stressors, "including exposure to cocktails of insecticides and fungicides, impacts of pathogens, and effects of poor nutrition." "It now seems that we have to add glyphosate to the list of problems that they face. This study is also further evidence that the landscape-scale application of large quantities of pesticides has negative consequences that are often hard to predict," Goulson said. This is the latest study to attempt to answer why bee populations are dying, a trend which could devastate worldwide crop production. For instance, between 2016 and 2017, U.S. beekeepers lost 33 percent of their honey bee populations, according to the University of Maryland and Bee Informed. And in the past decade, beekeepers and scientists have been grappling to understand a condition known as Colony Collapse Disorder. Motta told Newsweek: "Understanding how environmental stressors affect honey bee health may be crucial to reverse or to control the high mortality rate of bees observed in colonies in many places in the last decade." In April 2018, the European Union banned the use of neonicotinoids, a pesticide known to be harmful to bees. The European Food Safety Authority arrived at this conclusion following an analysis of over 1,500 studies which suggest neonicotinoids are harmful to bees, even when they are not sprayed on the crops which the animals feed off. Commenting on the role the general public can play in protecting bees, Motta said we must be cautious when spraying any kind of pesticide on flowering plants, where bees are likely to be present. "And we should appreciate the role of microorganisms in the lives of animals and plants. Many bacteria have beneficial ecological roles, so chemicals that affect bacteria can also affect their hosts." He warned: "We rely on bees for pollination of flowering plants, which includes many crops, so maximizing their health is in our interest." This article has been updated with comment from Dr. Dave Goulson and Erick Motta.